"Here it is, after months of hiccups, finally, I have completed the Road Runner Trapunto Quilt and be able to share the pattern and tutorial here!!!! 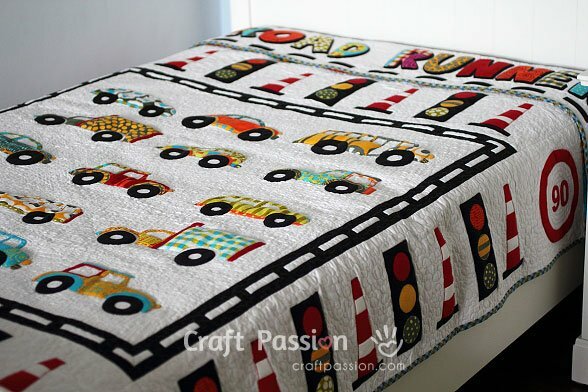 I must also thank my son, a big fans of cars and vehicles, for his persistent “kind reminders” to pull me back to quilt his long waited quilt blanket. "This is the second quilt project I have done after my daughter’s Secret Garden Trapunto Quilt published in May last year. Most of the method is the same except the piecing of the backing. I pieced the backing fabric completely before attach it to the front piece of Secret Garden quilt, I find it a little trouble to manage the 2 huge pieces for a good alignment by flipping them back-and-forth to check. I did a little improvised method here and it is so much easier than before. "My son can’t wait for the quilt to be washed, he wants it immediately after I declared that the quilt is completed!!! Oh, pity this cooperative young boy that he still has to wait for me to wash and take photos before he can use it. 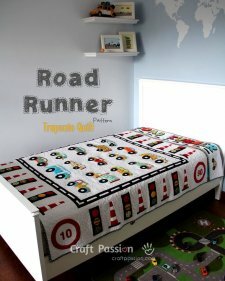 On that night while I tucked him in the bed with his long waited quilt blanket, he told me: “Mommy, next time if you have any project for us, please do it for me first, ok?”, I was instantly put on a guilt trip, I hugged him and promised that he won’t have to wait that long anymore." Also be sure to check out the numerous projects, tutorials, and recipes available on Joanne's site!